With a bit more time available than yesterday I went over to a nature park that borders on Germany: Bergherbos PAFF-060. I did not know the area but found an acceptable operating position using Google Maps. 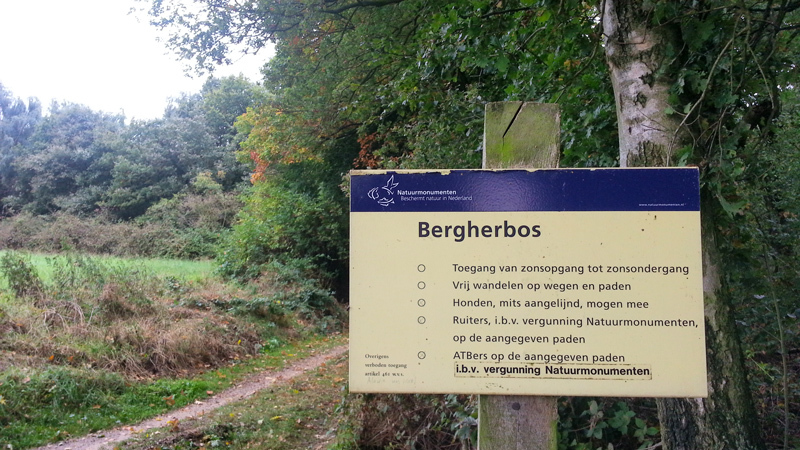 Bergherbos is almost completely covered with trees (hence the name "Bos", meaning forest). The spot I found was not perfect as I was partly under a line of trees but it was the best I could find. The wire did get stuck in some tree branches at one point, but luckily everything stayed in one piece. I planned to operate for about 2 hours, so I had some time to try different bands. I started on 15m as the cluster showed some activity there and it is a band that allows for DX to the west around the time I was active. It was busier than yesterday. I worked 34 stations in just over half an hour. Amongst them DX from UA9, W4 and W6. The last one was a pleasant surprise. 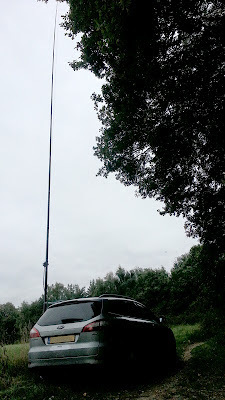 It was Wayne NN6R that I worked once before about a year ago on 17m. I don't work stations in CA that often and 9100km is quite a distance to cover when /P. The band was just opening over there so propagations weren't really stable but a QSO was possible anyway. When 15m slowed down I went down to 20m. It was very lively there with some QSB but still very strong conditions to some parts of Europe, like Russia, Poland and Hungary (a lot of 59+). I worked 84 stations in 45 minutes. DX came in from the east: JA, UA9, UN and 4Z. JA7AYE again set the maximum QRB to 9200km. To enable contacts on the shorter distance (150-600km) I set up my extended mast and my end fed for 40m. I worked 34 stations in 20 minutes there. Conditions on 40m weren't very strong but good enough for the short / medium distance. Before heading home I tried 10m as I saw some activity on the cluster. Listening around on the band I noticed signals were very low (S1) but I did give it a try for a couple of minutes. In the end only one OM from Pennsylvania came back to me - but I did activate PAFF-060 on four bands. Not bad. In the end I logged 154 calls in just under 2 hours radio time. A couple of OMs came by on two bands but only Luciano I5FLN and Sandro I0SSW came by on three. Thanks all for passing by.